Maybe you saw the comment on my first edible weeds post reminding me of when my eyes were first opened to the concept of weeds being edible. When I was in college I was fortunate enough to be able to do a study abroad program in Graz, Austria. That trip left a huge impression on me. I lived with a wonderful host family and made life-long friends. It’s also where my eyes were opened up to what incredible consumers we are in the US. At times I almost felt guilty for being from the US, even embarrassed. I think we’ve made great strides in the years since I was there, but we’re not even to the level of consciousness now that Europeans were nearly 20 years ago. Their impression of us was that everything is big. Big houses, big cars, Big Macs. My impression of them when I first got there was that they did everything the hard way and everything was small. Small cars, small houses, everything they bought came in small packages, with very little packaging. That was the first time I’d seen the small rectangular cartons that we can now buy broths, milk, etc. in. At the time they were foreign to me, including lunch. Lunch is the main meal of the day in Europe, which when you think about it, is way healthier than eating the main meal in the evening like the majority of Americans do. When you eat in the middle of the day you’ll get energy when you’ll use it vs. filling up when you’re winding down at the end of the day when we don’t need it and then turn it into storage! I’ll never forget the day I sat down to lunch with my host family and looked at the salad we were having. Everything in my bowl looked peculiar. The vinaigrette dressing was glowing green, but that wasn’t as disturbing as what it was on. I thought I was going crazy, but this “lettuce” that was in my bowl looked a lot like leaves of the most common weed at home. Since I’d just gotten to Austria and was still getting used to “Styrish” (the dialect in the part of Austria I was in) I thought something must be getting lost in translation. Did my host mom just say we’re eating dandelions for lunch? I laughed so hard at the concept. I mean seriously, these people are eating for lunch, what we are determined to destroy with chemicals everyday! Then I tried it. Awesome! The combination of the glowing green vinaigrette (made with pumpkin seed oil) and the dandelions soon became one of my favorite salads. The next phone call to my parents I told them to quit putting chemicals on the lawn – the dandelions were lunch! So there you have it, edible weed #2. Dandelions! Other than your front yard, dandelion greens can be found in co-ops, farmer’s markets and the mixed greens in most supermarkets. Weeds and leaves – cont. After I published my last post, I realized I forgot to mention one more thing about weeds. Sometimes, we inadvertently plant them. 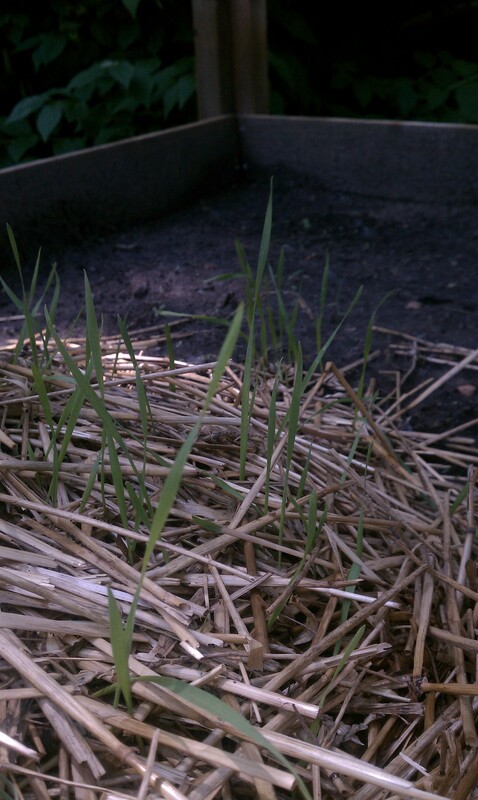 The past few years I’ve been putting straw on my veggie beds to keep the moisture in and keep the weeds down. This year, it backfired. So, lesson learned. Be extremely cautious in the future. Seeds + water + sunlight = sprouts (whether you planted them there or not). Oh, and another note about seeds and leaves that I omitted earlier. Not all seeds produce 2 leaves. Most do, and those that do are called “dicots” (di = two; cot = cotyledon/seed leaf), there is also a group of plants that only produce one leaf, they are called… you guessed it, “monocots” (mono = one; cot = cotyledon). Corn, grasses, grains and daylilies are all monocots and, as previously posted in Weeds and Leaves, plants are hard to ID by their seed leaves, even harder when they are monocots! I can pretty much guarantee I won’t be leaving these to see what they turn into though. Well, maybe. At least not in the bed between the other plants. Yeah, probably not. If you’re going to weed a garden, you definitely need to know what to pull and what to keep. If you’re not sure, leave it a few days or a week (or longer if necessary) until you can identify what it is. Once you’ve got your plant ID down or at least know what the plants you put there are “supposed to look like”, the rest would be considered “weeds” (a.k.a. – any plant in a place you don’t want it). I used the “leave it” method on a plant in my backyard a couple of years ago. When I first noticed it, it wasn’t very big, but I wasn’t sure what it was. It was in a very bad spot in my flowerbed, but I was too curious to pull it. By the time it got to be 7 feet tall (I kid you not) it had multi-lobed leaves and strongly resembled Mary J. except that I don’t have any experience growing that so I couldn’t say for sure one way or the other. So I waited, curious to see what it would “do”. Finally, near the end of the summer, it blossomed. Since the bloom was so far above my head, I may be short-changing it, but it ended up with a little, non-showy cluster of nondescript flowers. Then, it got pulled. Before you start weeding, I should back up a moment… make sure you know what you planted and what it looks like in each stage of growth. Most seeds start with 2 cotyledon/seed leaves. Seed leaves are made using energy stored within the seed and don’t have much character, so it makes it really hard to tell plants apart at this stage. It’s not until they develop their 2nd set of leaves, their “true leaves”, that plant ID really becomes possible and weeding becomes safe. As a side note, some plants will also have juvenile leaves which won’t look like their seed leaves or their mature leaves. This can sometimes trip you up a little, but once you know what you’re looking for, you’ll be fine. The best time to weed is after a lot of rain or after you’ve watered. This makes the soil loosen up and allows weeds to come out by the root, which is always the goal. It’s not always possible, but when it is, try not to just snap off the top or the root will just regenerate new top growth and you’ll literally end up weeding the same plant over and over again. More edible weeds to come. Rain or no rain, the sun is shining on me today. Since August of 2009 I’ve been “dealing with” a low-grade fever and fatigue. I had tons of testing done, which all showed something was off kilter, but I didn’t have any other symptoms so nothing could be pin-pointed. The best that they could figure was that I’d gotten some kind of virus that my body would just have to get rid of on its own. After already dealing with it for well over a year, that was hard news to take. My prescription was to get lots of rest, eat well and exercise as I could. In other words, live a healthy life. So I did, or at least tried my best. As part of all the testing that took place in the beginning, I had a CT scan that showed a “nodule” on my lung. Since then, I’ve been getting repeat CT scans every 6 months to make sure nothing has changed. Other quirks showed up on the follow-up scans as well, but thankfully those have disappeared and the nodule hadn’t changed. Much as I’ve tried to ignore it, in the back of my mind it’s been a constant concern, always wondering if my next scan will be different. I’ve lived each day being hyper-sensitive to what’s going on in my body wondering what every little change “means”. My most recent CT scan was at the end of May. The report came back “no change” but the nodule size had changed compared to previous reports. Since I don’t have background in the medical field, I didn’t understand how a size difference could mean “no change”. Literally, the next day, a newsletter came in the mail from Allina and in it was an article on a new Lung Nodule Clinic that opened in Minneapolis. I called. Last Friday I went in and met with a great team of doctors who reviewed my CT scans, PET scan, history, etc. I actually got to see the scans and they showed me how they were measured, explained why my nodule “looks good” and reassured me that it is highly unlikely to be Cancer. Whenever a nodule is found, they monitor it for 2 years. This fall will be 2 years for me, but just to be certain that there is no change, they are scheduling my final CT a year from now. My Dr. reassured me that there is no concern that this will change between now and then and after the final blessing a year from now, I never have to think about it again. Whew! I walked out relieved, yet in a daze. It was like a dream. It hadn’t settled in yet. In addition to this news, I haven’t had a fever since the beginning of May and my energy level has been gradually increasing. Another cause for celebration, but again, I was leery. I’ve lived with this for 2 years, sometimes it would go away for a few days or a week only to return again, so I was fearing it was taking a short vacation and then would be back. It hasn’t. I’m going on 2 months with no fever. Today I woke up energized. Smiling. Ready to face the world head on. I feel good. I have more energy today than I have in nearly 2 years!! I’m so thankful. And excited!!! Thank you so much to my family and friends for the many, many prayers. They worked! The unknown is a very scary place to be. I’m so glad to be back!